What is an EdCamp? Why has it been among my first priorities as a new Head of School to host not one, but two? Our first EdCamp of the year, organized as part of a year long series of Jedcamp (Jewish EdCamp) events throughout the New York/New Jersey area, balanced elements of Edcamp and elements of more traditional professional learning events. Described to potential participants as an Educational Technology and Social Media Conference, we sought to bring in educators not yet familiar with “unconferences”, for whom the thought of attending an event without knowing what sessions would be offered in advance still sounds foreign. On a chilly, Wednesday evening in Queens, close to one hundred educators from throughout the region came together to learn about ways educational technology and social media can enhance and even redefine learning and community for our students and their families. Sponsors covered the costs of dinner and snacks as well as door prizes and raffle prizes for participants. Attendance was free. Session topics at our regional conference included: online and blended learning, project based learning and technology, educational technology for beginners, professional learning using social media, using educational technology to enhance the Judaic Studies classroom, using educational technology to enhance the Hebrew language classroom, eleven uncomfortable truths you need to hear about filtering the web, lessons learned from a 1:1 ipad rollout, using technology to more effectively differentiate instruction, smart use of smartboards in the Judaic Studies classroom, engaging parents through social media, collaborative learning with google docs, digital Judaic studies resources, blended learning in the Hebrew language classroom, and putting social media to work for school public relations. The level of learning and engagement was extremely high and teachers from schools throughout the region gained knowledge, insight, and connections to continue their collaborative learning and exploration. Our own teachers who attended the event felt proud of our school as a place in which professional learning is taken seriously and asked for more, requesting that next year we have another conference and hold it, not on a week night but on a Sunday to allow more time for the learning and sharing. The talent of those presenting was impressive and the cost of such professional learning in traditional venues in which presenters are paid, would have been prohibitive. The open, respectful collaboration and commitment to engaging all participants was priceless. Our second EdCamp of the year, planned on a professional learning day, was exclusively for our own teachers and ran as a pure “unconference”. We introduced the notion of participant driven professional learning and invited teachers to present and to learn. To our delight, session slots quickly filled with volunteers. While several adminstrators, including myself, stood ready to add our names to the sign up board to teach a session in the event teachers did not sign up to lead, we did not have to do so. Teachers stepped forward, excited about facilitating learning for colleagues. Topics included: classroom centers to support learning, bringing teacher passions into the classroom, making our teaching relevant to students’ life experiences, successes and challenges in implementing common core math, making modifications and accommodations for students with special needs, and helping students develop effective organizational skills to enable learning. Additionally, our educational technology coach, based on pre EdCamp teacher requests, led two sessions – creating online classroom spaces with Edmodo and educational technology tools to support reading comprehension. “It wasn’t boring,” one teacher remarked, implicitly critiquing typical PD workshops well known to teachers in our school and in many schools. “No ‘expert’ read slides to us or spoke on and on without understanding our needs,” shared another. “I’m no longer afraid of technology,” excuded a third with a huge smile and a little dance, after attending both sessions taught by our ed tech coach. “We had fun,” said a fourth. “It was a fantastic day, and we all thought so,” asserted a fifth, confident she could speak on behalf of her colleagues. Have you attended an EdCamp? Are there other opportunities for participant driven learning you have experienced? What ideas do you have to continue to make professional learning among teachers respectful, relevant, and impactful? “Anyone can learn tech skills, but not everyone has the heart of a teacher,” a superb classroom teacher at my school recently shared with me. And, I entirely agree. 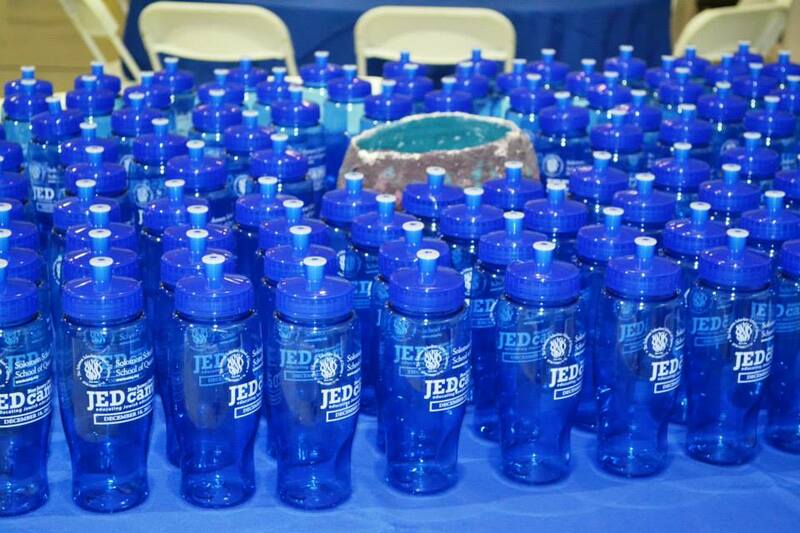 It was that sentiment that motivated us at The Solomon Schechter School of Queens alongside Jedcamp to sponsor an Edcamp inspired Educational Technology and Social Media Conference. We weren’t “officially” an edcamp. Instead, we danced at the edge of edcamp style learning, striving to meet the needs of educators who are not yet comfortable in the world of professional learning networks and unconferences; educators for whom the thought of attending a conference, or rather an unconference, without knowing what sessions are being offered in advance still sounds foreign. Sensing that some of our teachers with great heart might be suspicious of coming out to a learning experience without knowing topics in advance and might feel tentative and insecure around the networked crowd to which our local unconferences have primarily appealed, our school’s educational technology coach Rebecca Penina Simon and I sought to bridge the gap. Our learning experience was free, non-commercial, interested in furthering the edcamp mision (to support free edcamp unconferences for educators to exchange ideas and learn together) as well as the edcamp vision (to promote organic, participant-driven professional development for K-12 educators worldwide), and reliant on the “law of two feet” that encourages participants to find a session that meets their needs. We broadly recruited presenters and welcomed all who volunteered to lead sessions. 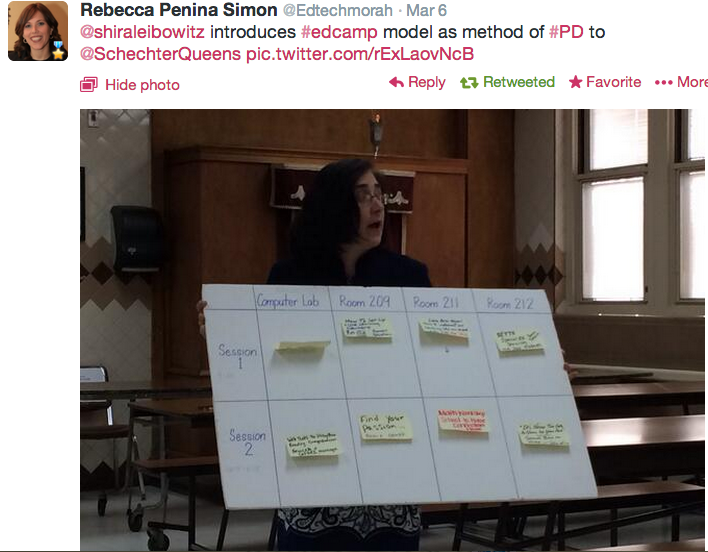 However, veering from the edcamp style unconference, we determined and advertised sessions in advance. In addition to sharing information about the conference via social media, we placed an ad in our local newspaper and asked regional schools to share information about the conference with their teachers. We sought to include topics connected to educational technology and social media that would appeal to educators in a wide range of roles and with diverse comfort levels and experience using educational technology and social media. The registrations poured in. 106 educators signed up in advance and, on a cold Wednesday night in Queens, NY, close to 100 educators actually showed up; battling icy roads, traffic, and in many cases one if not two bridges. Some were teachers in our own school, energized by a style of participatory learning to which they had never before been exposed. Some were members of our own professional learning networks with whom we speak on twitter and Facebook and whose blogs we read. Yet, many were educators whose names we did not yet recognize. We networked, connected, collaborated, shared, and learned together. Our conference was one of a series annual events for #jedcampnjny, an effort among Jewish educators in the greater New York area to extend edcamps from one-shot learning experiences into a community of learners within our regional schools, connected via regular face to face activities as well as on-line engagement. So, what was the biggest complaint of our teachers at the end of the conference? Too little time, too much to learn! What was their recommendation? Let’s have more such conferences in the future. Let’s hold them not on a week night, but rather on a Sunday when we can spend more time. Let’s continue the learning.